Quality HVAC Service Near Me in Greensburg, PA | Donahue's Inc. AC Repair & Service - Furnace Installation and Repair Greensburg. Heating And Cooling Contractor, Furnace Repair, Furnace Service, Furnace Installation, and Heating Repair. Trustworthy Heating and Air Conditioning Repair Company Near Me! Day or night, we're here for you! The Donahue's team of experts is well-versed in commercial heating, cooling, and refrigeration! 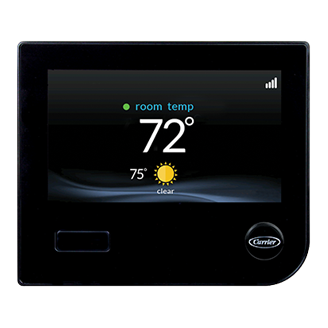 Our Carrier thermostats offer impressive energy savings and Wi-Fi connectivity! Donahue's is a Factory Authorized Carrier dealer, offering unbeatable comfort and technology. As a Carrier Factory Authorized Dealer, Donahue's delivers the premier solution to heating and cooling for your home and business. We've earned this distinction through continued industry training, in-depth product knowledge, and the highest commitment to customer service and satisfaction. We offer a wide spectrum of services, equipment and options, answering the specific temperature control needs of our clients. We are problem-solvers, bringing you mini-split systems for ductless air conditioning, heat pumps, air conditioning systems, and solutions to air quality concerns. We offer ENERGY STAR labeled products to guarantee efficiency, and commercial refrigeration for local restaurants and businesses. Residential and commercial HVAC are our specialties. Our NATE-certified technicians have the knowledge, experience and insight to design a comfort system for a single room, average residential home, or an industrial-sized space. Donahue's is a full service commercial HVAC contractor. We've been servicing, maintaining and installing commercial HVAC systems and chillers since 1962. We can help extend the life of your equipment as well as maintain its efficiency. Our team is dedicated to the lasting satisfaction of our growing client list. Donahue's delivers swift action, competent service and the most economical options. We offer seasonal promotional incentives to better serve your financial needs. Give us a call and speak with a knowledgeable, courteous professional for your home and commercial comfort. We provide the expertise and service to make you feel right at home! At Donahue’s we’re proud of our years of service to the Greensburg area and look forward to helping you with your air conditioning and heating needs. We’re pleased to serve both residential and commercial customers in Greensburg, Latrobe, and Irwin; our team is prepared to help you with the sales, service, and installation of the comfort system that is ideal for your home or business. And be sure to ask Donahue’s for a free estimate. Whether it’s a new installation or routine service, our factory-trained technicians provide the expertise your comfort depends on. And at Donahue’s, we repair all makes and models. When it comes to your family, you want dependable air conditioning and heating systems that provide you with value as well as comfort. You can count on Donahue’s. As a family-owned business, we understand the importance of protecting your family’s health and well-being. We understand that traditional HVAC systems may not be for everyone. If you’re looking to install and air conditioning in an office space, or in your home, but don’t want to use a traditional air conditioner, ductless ac/mini-split system may be for you. Our ductless AC units are compact and do not require ductwork, so they’re simple to install and can help you select what rooms you want to cool, rather than cooling your entire house. Ductless HVAC systems can be an energy efficient alternative to a traditional furnace/ac system, so if you’re interested in ductless air conditioning/ductless mini splits for your home, call Donahue’s Inc. today for more information! At Donahue’s Inc. we’d like you to know that we offer HVAC service for all types of equipment including heat pumps. If you are in need of heat pump repair, service or would like to install/replace a heat pump at your home, our technicians have the experience and tools to get the job done right the first time. As a 5-Star rated HVAC company on Google, you can trust that we put our customer’s needs first. So don’t hesitate to give us a call to take a look at your heat pump or other HVAC systems today at 724-261-3634! Donahue’s Inc. is proud to provide quality duct cleaning services now. If you’re looking for a great way to improve the air quality in your home, reduce your energy bills, and prolong the life of your HVAC systems, then duct cleaning may be the right choice for you. Vent or duct cleaning can help reduce the amount of dust, dirt, and possibly mold in your vents, allowing your heating and cooling systems to run more efficiently, saving you money and improving your health. To learn more about our duct cleaning services, don’t hesitate to call us today! Donahue’s Inc. Heating & Cooling refers its customers to the following quality lender for their financing. Click here for more details and enter the promo code below.